Standing next to a herd of cows and their calves on his family’s farm in eastern Franklin County, Kevin Hockensmith pointed to a sinkhole — a visible sign, he said, that Kentucky’s underground limestone terrain isn’t suited for a pipeline. Hockensmith, who tends more than 100 cattle on the 500 acres, said he recently turned down an offer of $190,000 for an easement to allow construction of the proposed Bluegrass Pipeline through his property, worried a leak could harm his cattle and his farm’s water. “It’s money now, pay for it later,” Hockensmith said. He said the land in Woodlake, forked by Elkhorn Creek, has been in his family since 1882. Hockensmith isn’t the only property owner who has rejected a large payday in exchange for an easement. In recent months, the proposed pipeline has prompted a great deal of media attention, landowner concern and environmentalist opposition. But as the controversy over the Bluegrass Pipeline continues, several of its competitors are continuing their efforts to reverse the route of 1,000 miles of the Tennessee Gas Pipeline and change its cargo from natural gas to natural gas liquids — the same materials the Bluegrass Pipeline would carry. 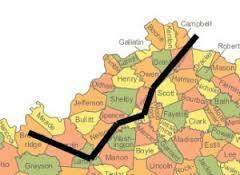 And unlike the Bluegrass Pipeline, which must build about 200 miles of new pipe through Franklin and 12 other counties before connecting to an existing line in Breckinridge County, the Tennessee Gas Pipeline already runs beneath Kentucky soil. The company may not need landowner permission to switch the pipeline’s cargo from gas to the liquids — byproducts of natural gas mining often used to make plastics. It also may not be affected by some state legislators’ recent efforts to clarify that companies seeking to build pipelines carrying liquids can’t use the power of eminent domain. Company representatives say the pipeline passes about 60 miles east-southeast of Franklin County. Tennessee Gas, a nearly 14,000-mile system now owned by Houston-based energy giant Kinder Morgan, had 89 incidents causing two injuries and about $87.9 million in property damage between 2006 and 2013, according to records from the federal Pipeline and Hazardous Materials Safety Administration. That’s about $6,400 in property damage per mile. A 2007 incident in Cypress, Texas, caused one of the injuries atop $1.1 million in property damage. The incidents also included four in Kentucky. One in 2006 caused about $888,000 in property damage in Clark County, another in 2009 caused $115,000 in Greensburg and two in 2011 caused almost $200,000 each in Winchester and Greenup. During the same time period, Texas Gas Transmission — a portion of which will become part of the Bluegrass Pipeline project — saw an average of $459 in property damage per mile. Three incidents happened in Kentucky, including one in Slaughters in 2007 that caused an injury and $288,000 in property damage. In an email to The State Journal, a spokeswoman for Kinder Morgan argued it would be “unfair and misleading” to consider much of the Tennessee Gas Pipeline’s safety record in discussing Kinder Morgan’s record because it only acquired the pipeline in 2012 when it bought another company. Kinder Morgan’s spokeswoman noted that about 60 of Tennessee Gas Pipeline’s 89 incidents occurred on offshore pipelines and facilities, and wrote that Tennessee Gas sold virtually all of those assets last year. Kinder Morgan owns many other pipeline operators. One is Kinder Morgan Liquid Terminals, which, unlike Tennessee Gas, already carries hazardous liquids — a specification that includes not only natural gas liquids but also the more common oil pipelines. From 2006 to 2013, Kinder Morgan Liquid Terminals had 72 incidents causing one injury, one death, $54.1 million in property damage and 15,499 gross spilled barrels. That company operates only 69 miles of pipeline, so it has a high ratio of $783,000 in property damage per mile. The federal government has collected $442,600 penalties from Kinder Morgan Liquid Terminals. Kinder Morgan’s spokeswoman responded that terminals businesses and pipelines “are totally different businesses and not susceptible to easy comparison” and said the incidents all occurred inside the properties’ fence lines and in contained areas. The company countered that its research shows its 3-year average number of gas pipeline incidents per 1,000 miles is 0.28 — lower than the transmission and gathering industry average. It also said its releases for onshore pipelines in the public right-of-way carrying liquids or carbon dioxide were lower than industry averages. “Kinder Morgan is dedicated to protecting the public, our employees, contractors and the environment,” the company stated. Carl Weimer, executive director of the Pipeline Safety Trust, said Kinder Morgan had a “pretty poor safety record” around 2006. His organization is a nonprofit that argues current pipeline regulations are lacking and seeks to improve them. Weimer said the federal Pipeline and Hazardous Materials Safety Administration put Kinder Morgan on a rare notice for not just one incident, but for a “broad swath” of its hazardous liquids transporting system in the western United States. He said he heard regulators were concerned that Kinder Morgan, a relatively new company, was acquiring old pipelines very rapidly. “There were some concerns whether they knew history of pipelines well enough to operate them well,” Weimer said. Weimer said studies are needed to determine whether pipelines originally meant to transport gas can safely transport liquids, which have more weight and pressure and can place more fatigue to pipelines. Also, gas compressor stations along the pipeline must be changed to pump stations, which he said could cause problems because they are meant to increase pressure to keep the liquids flowing. When released, natural gas liquids can pool and drip through Kentucky’s karst geography — springs, caves and sinkholes formed by water dissolving soluble rock, such as limestone — into its aquifers. They can also form flammable, heavier-than-air vapor clouds. There is concern over the sensitivity of automatic systems to detect leaks. Pipeline operators also use periodic foot patrols and flyovers to spot problems, but such automatic systems have the potential to allow much faster response. “Remote leak detection — everybody wants it, but in fairness to the industry, it can be very hard to do,” said Richard Kuprewicz, who does risk management and pipeline investigations as president of Accufacts, a consulting firm. Tom Droege — a spokesman for Williams, one of the companies partnering on the Bluegrass Pipeline project — wrote in an email that the company’s Pipeline Control System is designed to alarm if the pipe loses 65 barrels (2,730 gallons) in 10 minutes, 130 barrels (5,460 gallons) in 30 minutes, 205 barrels (8,610 gallons) in an hour and 1,735 barrels (72,870 gallons) in 12 hours. With help from the Pipeline Safety Trust, The State Journal sought to identify the number of incidents from 2006 to 2013 of all companies owned by the corporations involved in both the proposed Bluegrass Pipeline and Utica Marcellus Texas Pipeline projects — the name of the project that aims to convert the Tennessee Gas Pipeline from gas to liquids service. The trust is developing “scorecards” to compare safety records of different companies, though Weimer noted it’s “damn near impossible” to figure out all the pipeline operators each parent company owns. Along with the scorecards, The State Journal consulted companies’ websites, Securities and Exchange Commission filings and company spokespeople. Kinder is partnering with MarkWest Utica EMG in the joint venture Utica Marcellus Texas Pipeline project. MarkWest Utica EMG is itself a joint venture between MarkWest Energy Partners and a private investor company that doesn’t appear to directly operate any pipelines. The Tennessee Pipeline section proposed for conversion actually consists of several pipes running parallel. Kinder Morgan spokesman Richard N. Wheatley said that only one or two of the pipes — which stretch from Mercer, Pa., to Natchitoches, La. — would be converted. Kinder Morgan and MarkWest appeared to own 21 different pipeline operators that reported incidents from 2006 to 2013. Their roughly 350 total incidents caused about $227 million in property damage, 11 injuries and two deaths. Only five of those incidents were from MarkWest. Williams and Boardwalk Pipeline Partners — the companies partnering on Bluegrass — appear to own five different pipeline operators that reported incidents. Their 107 total incidents caused about $119 million in property damage, two injuries and one death. MarkWest’s Chief Executive Officer, President and Chairman Frank M. Semple said in August that volume projections for natural gas liquids indicate there is only enough to support for one of the two projects. The Bluegrass Pipeline is facing flak over claiming the right to build on landowners’ property even if they don’t agree to sell easements. A legislative committee chose Wednesday to move to the House floor a bill clarifying that natural gas liquids pipelines don’t have that power, called eminent domain. But the competing Tennessee Gas Pipeline may not need new easements to switch its cargo from natural gas to natural gas liquids. The Tennessee Gas Pipeline obtained easements when it was built across Kentucky in the 1940s, according to Kinder spokesman Richard N. Wheatley. Contacted again Tuesday about whether the company had reviewed said easements, Wheatley said he had no update. If the easements do allow the pipeline to switch from natural gas to natural gas liquids, eminent domain may not be needed. Weimer, of the Pipeline Safety Trust, noted that natural gas companies first claimed the right to seize easements on owners’ lands because their pipelines served a public good. “Now, come to find out not many liters later, that we don’t need those gas pipelines and we’re going to turn them into liquids,” Weimer said. Whether or not new easements are required, converting a pipeline would still require regulatory authority to switch course from carrying gas to the Northeast to instead carry liquids to the Gulf Coast, where export and other facilities that process the liquids currently are located. And as both projects press forward, opponents press back, in part by drumming up the possibility of leaks. For landowners like Hockensmith, the concern over a spill resonates, despite companies’ assurances that issues are rare. Williams and Boardwalk Pipeline Partners. A proposed pipeline will transport natural gas liquids from the Marcellus and Utica shale producing areas in Pennsylvania, West Virginia and Ohio to the Northeast U.S. and the U.S. Gulf Coast. Opponents are concerned about safety and alleged environmental effects as well as the role of eminent domain laws for use of private property. WEKU's Eastern Standard of 9/12/13 discussing the Bluegrass Pipeline.